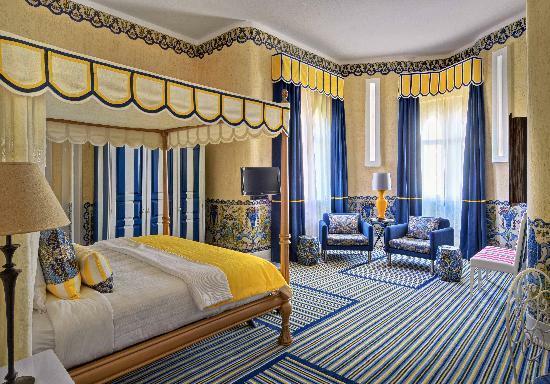 Opened in 1934, the 5-star boutique hotel, with unique views of Praia da Rocha beach, was refurbished by award winning Portuguese interior designer Graça Viterbo, who introduced bold colours with a sea theme into the classic rooms. The L’Occitane Spa, also by Viterbo, is equally vivid in decor and the restaurant offers menus created by chef João Oliveira. One of the most recent 5-star additions to the region, modelled on an 18th-century Portuguese palace with Moorish themes and striking interior designs by Miguel Cancio Martins, the Conrad is a sumptuous hotel offering first class comfort. Acclaimed chef, Heinz Beck, who has three Michelin stars at his Rome outpost, offers contemporary Mediterranean cuisine in Scandinavian-inspired surroundings. Set in acres of pine forest overlooking Falésia beach in Albufeira, the Epic Sana boasts modern rooms and suites, complemented by contemporary facilities and state-of-the-art technology. Make the most of the location and follow the pathways meandering through the greenery all the way down to the shore, or pamper yourself at the extensive Sayanna Wellness SPA & Fitness Centre, which offers bespoke beauty treatments. A 5-star family hotel set in the middle of the dunes, the Martinhal hotel and resort is the brainchild of entrepreneurs Chitra and Roman Stern. With a large family of their own and a taste for luxury, they created their idea of a perfect family holiday destination. The result is an elegant resort overlooking Martinhal beach, offering family entertainment for both kids and grown ups. Hidden along a country road in the eastern Algarve, the little whitewashed Pensão Agricola has just six rooms and looks out over the swimming pool and meadows. Dating back to the 1920s, the converted one-storey farmhouse, with its cement floors topped with woven rugs and traditional reed ceilings painted white, emphasises all things Portuguese, from the cork lampshades to the books on the shelves. Encompassing a fabulously scenic golf course with breathtaking views over the cliffs and plunging into the ocean, Pine Cliffs Hotel is second to none when it comes to location. Following an 18-month refurbishment and a €50-million investment the resort is gleaming anew. On top of brand new seafront suits the hotel boasts numerous restaurants, the popular Annabel Croft tennis academy and an array of beach activities. A little gem amongst the five star units in the Algarve. Located at the centre of the region this German run establishment is known for its top-luxury service. Set on the cliffs overlooking the sea, offering two-star Michelin cuisine, a beautiful spa and luxurious suites and rooms, it is the Algarve’s most hedonistic retreat. Built in traditional Portuguese style, with whitewashed exteriors, Vila Vita Parc is all about comfort and luxury. The whole resort is set around lakes and fountains amid lush subtropical gardens with commanding sea views and direct access to the beach. From an impressive wine cellar and two Michelin-starred restaurant to an outstanding spa and a multitude of sporting activities, this five star resort offers something for everyone.